You can find us in Horni Smrzovka below ridges of Cerna Studnice, Spicak and Bukovec. 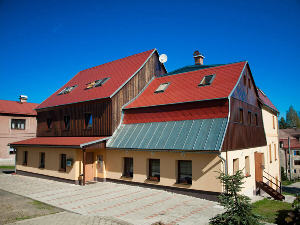 Our guesthouse is about 5 km away from Jablonec nad Nisou and you can see spectacular view of Krkonoše from our windows. There is 600 m long ski lift Filip with an opportunity of night skiing and with artificial snowing (in case of lack of snow). It´s only about 500 m away. 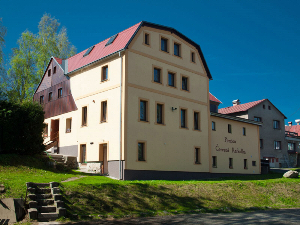 Our guesthouse is situated in Horni Smrzovka which is a nice town with clean environment under the ridge of Cerna Studnice in national nature protected area of Jizera mountains, about 5 km away from Jablonec nad Nisou and 2 km from Tanvald. 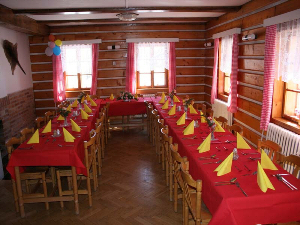 There are about 4000 inhabitants in Smrzovka and it´s a center of summer and winter hiking. You can find many ski lifts around the place. If you are an experienced downhill skier you can visit Tanvaldsky Spicak (black, red and blue piste and a special ski lift for small children), Horni Maxov, Bedrichov, Paseky and famous ski centre Harrachov in Krkonose (about 20 km). For cross country skiers there are are hundreds of lanes in a beautiful countryside, all well marked. Smrzovka is also a famous center of profesional sledging and there are many interesting tourist places such as 100-year-old train bridge, several lookouts, Real Pivrnec´s pub (Pivrnec is a typical and famous Czech character of cartoon jokes) and a disco Kinoklub (every Friday and Saturday). During your tours you can choose from many tourist and cycle routes (well marked even for foreigners) which lead you over ridges, woody terrains and pastures with interesting fauna and flora. There are many lookouts in this region such as Cerna Studnice, Bramberk, Spicak, Hvezda, Kamenna vyhlidka and Kralovka with a magnificent view of mountains. If you like water sports and swimming you are in the right place too. 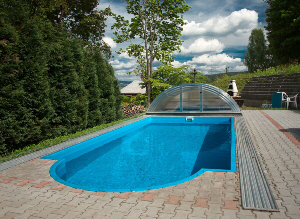 There is a natural swimming pool in Lucany (about 3 km from our guesthouse), 3 dams in Jablonec nad Nisou with nice grassy and sand beaches, aqua center in Jablonec and of course Babylon in Liberec (the biggest roofed funny and water centre in the Czech republic). We recommend you visit of Cesky Raj (30 km away) where you can visit castles Trosky, Kost and mysterious Skalni mesto. There is also Josefodolsky, Jedlovy vodo-pád (waterfall) 5km away and a ruptured dam. Trip to Bozkovske dolomitove jeskyne (caves 20 km away) is also very attractive. Our place is about 110 km away from Prague.